39'8" by 30'3" by 8'11"
"Sonia" was a more successful design than "Helen", serving throughout the Pacific. Though somewhat slow, it was unusually well protected for a Japanese design, was easily maintained, and was well-liked by its crews. It had a good rough-field capability. The design originated in December 1937 with a specification issued to Mitsubishi for a ground attack aircraft based on the Ki-30 "Ann". 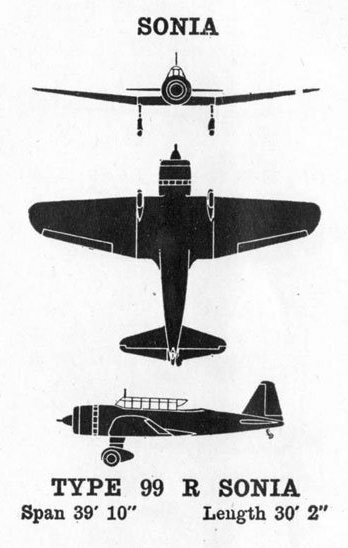 The Japanese Army wanted a smaller aircraft capable of operating on short airstrips close to the front. The design team shortened the cockpit and gave the rear cockpit a limited set of instruments and controls. The bomb bay was eliminated and the wings were lowered to permit a sturdier undercarriage. A prototype was completed in June 1939 and, with modifications to improve handling and the addition of 6 mm armor plating around the cockpit and engine, the design went into production in January 1940. The aircraft was designed so that the rear cockpit instruments and controls could be replaced with camera equipment for photoreconnaissance. "Sonia" was so well liked by its crews that a new production line was set up as late as 1944 at Tachikawa First Air Arsenal (Tachikawa Dai-Ichi Rikugun Kokusho). The aircraft was assigned to kamikaze missions in the final months of the war, and a few relic aircraft were used by the Indonesian Air Force against Dutch forces postwar. An attempt to produce a more powerful version with retractable landing gear in Manchuria came to naught, but was discovered by Allied intelligence, who assigned the new aircraft the code name "Edna".